Like their counterparts used in medical clinics, dental disposables have multiple benefits for both care providers and patients. The rise of dental disposables is due to the fact that disposable instruments and equipment eliminate the time and costs of constant cleaning and sterilization of reusables. Staff can spend less time on cleaning and more time on working to care for patients, which is billable time rather than down time. Clinics spend less money on equipment maintenance and utilities. With dental disposables, dentists, dental assistants, and dental hygienists can throw away used product and often recycle. While in some circumstances the cost benefits are negligible, the use of disposables greatly reduces infection risk (both infection and cross-infection) due to sterilization at point of manufacture as well as maintenance of that sterilization through proper packaging. 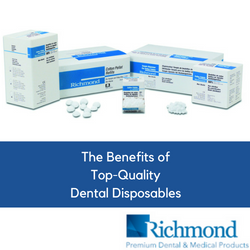 Whether dental professionals want to save money, time, or would rather devote smarter resources to reducing infection and cross-infection risk in the office, Richmond Dental and Medical is an elite manufacturer and provider of disposable dental supplies. In fact, several product categories are disposable. For example, we have an array of disposable rolls to meet a variety of clinical applications, including our braided cotton rolls (which received a Best Product Award from Dental Product Shopper), wrapped rolls, and Reflective Shields Plus® (which achieved 2018 Preferred Product status from Dental Advisor)--all made at our home facility in Charlotte, North Carolina. Another great lineup of dental disposables are our cotton pellets used in root canal procedures, made in Charlotte from 100 percent medical grade, purified cotton. Richmond also offers disposable level 1 face masks for routine cleanings, as well as disposable level 3 face masks used by dentists during surgical procedures. Both the Level 3 Path-O-Gard® and Level 1 Earloop Face Masks are made in the USA. Our award-winning, SteriPockets®, a four-time recipient of Dental Advisor’s Editor’s choice designation, are disposable sponges used by dental professionals after an extraction. With their sterile protective packaging, SteriPockets® give clinicians confidence that the sponges will remain sterile until used, in addition to greater control over the amount of gauze dispensed to patients. Richmond offers a variety of sponges and gauze products, including: 100 percent cotton nonwoven sponges, both all-natural and biodegradable; rayon/polyester disposable sponges ideal for cleaning surfaces and instruments; MultiPly™ Nonwoven Sponges; cotton-filled; and all-gauze sponges. For many years, clinicians were reluctant to switch from reusable instruments and supplies to disposables. With multiple benefits available to practitioner and patient alike, those days are over. Now, younger generations of dentists insist upon using as many disposable instruments, supplies, and equipment in their offices as possible, wanting high quality at fair price points. Whether it’s cotton rolls, pellets, face masks, or sponges, Richmond Dental will be here, leading the way with elite dental disposables for generations to come.